Meets the first and third Tuesday of every month in the Adult Learning Conference Room at 3:00 p.m. Writers are welcome to come share their essays and take part in writing exercises. There are no dues. Everyone is welcome. Usually meets once every month in a member's home. Contact: Renita Sue Loyd (304-765-7602) or wvwriter007@hotmail.com. PENS writer’s group meets the 2nd Thursday of each month, at 5:15 p.m. at Taylor Books in Charleston. For information please contact Martha Mozingo, Spalding@marshall.edu. All skill levels and genres welcome. Workshop style group: submit your piece before the meeting, and receive requested critique in group. PENS writers are professional, curious, helpful, educated, serious writers, always welcoming to new friends. The Crow's Quill meets every other Wednesday from 6 PM to 8 PM in the conference room of the Fairmont chapter of the YWCA on Pleasant Valley Road. The group specializes in critique of prose and genre. Writers may submit pieces for critique online to the moderator or bring hard copy to meetings. The group formed in 2005. Contact: T.W. (Terry) McNemar at twmcnemar@frontier.com . Patchwork Writers meet the second Monday of each month at St. Paul Lutheran Church at 6p.m. Contact Susan Nicholas at tvnews3@frontier.com for more information. Usually meets at the Martinsburg-Berkeley County Public Library (101 King Street) from 1 to 4 PM on the first and third Tuesdays of every month. Bring 8 copies of the work you want critiqued. Limit: 10 double-spaced pages. This group was created in November 2003 to conserve, produce, and promote Traditional Poetry. Usually meets at the Martinsburg-Berkeley County Public Library on the first Sunday of every month from 2 to 4:45 PM. Contact: Annemarie Collins (304-267-7567) or annemarie@ix.netcom.com. 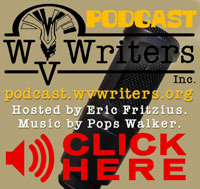 The Point Pleasant Writers Guild meets every1st and 3rd Wednesdays of each month, 1:00 - 3:00 pm at the Point Pleasant Mason Co. Library (304-375-0894). For more information contact Patrecia Gray 304-675-7929. Meets at the Morgantown Public Library, usually 2nd, 4th Tuesdays (6:30-8 p.m.). Manuscript critiques, market writing assignments, group writing, presentations. Contacts: Library (304-291-7425) or email to: George.Lies@mail.wvu.edu. (UPDATED 3/10/14) Sacred Way Poets meet (almost) every Monday from 7-9 PM in the conference room (2nd is dedicated to the writing and critique of the poetry of the participants. Bring 10-12 copies of work which you wish to present for critique (please no published or finished work). We are dedicated to assisting the poet in the completion of poetry which will then be ready for submission for publication. The group also offers assignments and suggestions for the writing of a poem. $5.00 donation to help defray cost of room rental. Contact Susan Sheppard @susana.sheppard.3@facebook.com or Sherrell Wigal 304-481-5912. Meets at 6:30 p.m., the second Tuesday of each month at the Princeton Public Library. Contact: Raymond Neeley raymond_neely@yahoo.com. Appalachian Wordsmiths meet every Tuesday at the Ripley Library from 10am till noon. We bring copies of our work to critique. Contact Max Price at mcprice2@suddenlink.net or Janet Smart at wvsmarties@yahoo.com for more info. Sponsored by the Hampshire County Arts Council. Usually meets the third Tuesday of every month @ 7 p.m. at the Bank of Romney Community Building on Main Street. Bring 6 copies of the work you want critiqued. 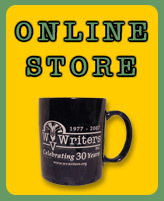 Publishes chapbooks and collections IMW members' writings. Sponsors a Visiting Writer each spring to conduct workshops in the schools and to perform with the IMW for the public. Contact: Larry Brown (304-822-7516) or Sibyl MacKenzie (304-822-7206). A semi-closed group meets in the St. Albans Library every Tuesday at 1 p.m. If you want information about membership, contact Brenda Beatty: (304-727-3015) or icbeatty7@suddenlink.net. A newly formed Women's Writing Circle meets every other Friday from 10am-12pm at the Cunningham House Bed & Breakfast Inn, to discuss aspects of personal memoir and essay, fiction and historical non-fiction, poetry, contemporary and classic literature, and much more. Each group is facilitated and there is a small fee to participate. Please contact Liberty Newberry for details and dates: (706) 614-7112 or libertyshea1980@gmail.com. Meets the second Tuesday of each month at 6 p.m. at the Summers County Public Library, 201 Temple Street in Hinton. Contact Raymond Neely at raymond_neely@yahoo.com.